What Day Of The Week Was July 29, 1976? 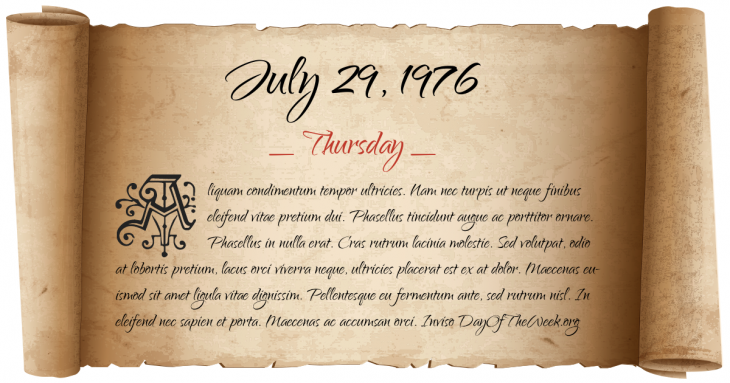 July 29, 1976 was the 211st day of the year 1976 in the Gregorian calendar. There were 155 days remaining until the end of the year. The day of the week was Thursday. A person born on this day will be 42 years old today. If that same person saved a Penny every day starting at age 6, then by now that person has accumulated $134.16 today. Here’s the July 1976 calendar. You can also browse the full year monthly 1976 calendar. Dragon is the mythical animal and Fire is the element for a person born on this day if we consider the very old art of Chinese astrology (or Chinese zodiac). In New York City, David Berkowitz (aka the “Son of Sam”) kills one person and seriously wounds another in the first of a series of attacks.